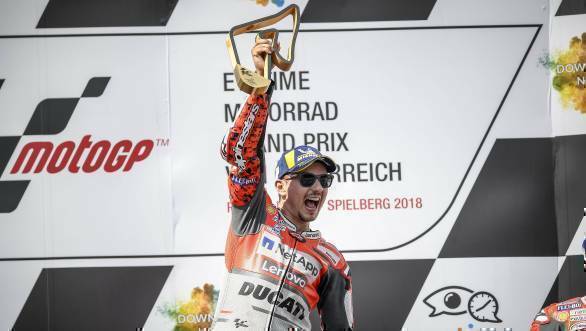 The MotoGP round at the Red Bull Ring in Austria went very well for Jorge Lorenzo, who managed to take his third victory of the 2018 season. 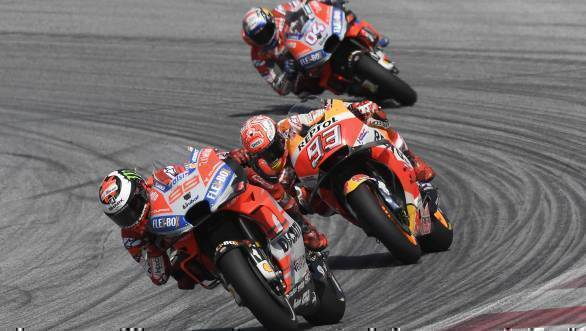 This was despite the fact that Marc Marquez did lead the race for a long time, until the Ducatis managed to come close enough for proper scrapping to begin. During the closing stages of the race, it was Lorenzo who put on a stunning show astride his Ducati, managing to take victory away from the Repsol Honda rider. The pair swapped positions several times, even as Andrea Dovizioso, on the second GP18 faded away into the distance. In the end, it was Marquez who led into the final lap, but Lorenzo managed to move into the lead at Turn 1, and hold off a hard challenge from Marquez at the third turn, eventually crossing the chequered flag first. While Marquez was second, Dovi would have to settle for third place. Cal Crutchlow of LCR Honda took fourth place, ahead of Danilo Petrucci on the Pramac Ducati. Valentino Rossi took an impressive sixth place, after having qualified 14th, finishing ahead of Dani Pedrosa on the second Repsol Honda, and Alex Rins astride the Suzuki. Tech 3 Yamaha's Johann Zarco took ninth place, followed closely by Alvaro Bautista astride the Angel Nieto Ducati in tenth. Avinitia Ducati's Tito Rabat finished eleventh. It was another less than perfect start for Maverick Vinales, who managed to end the race twelfth on the second factory Yamaha. Andrea Iannone ended the race in thirteenth place, ahead of Bradley Smith on the Red Bull KTM, while LCR Honda's Takaaki Nakagami finished fifteenth, the last of the points scorers.